A whopper of a solar flare that fired up earlier this week is wreaking havoc on some radio communications on Earth, and could spark exceptional auroras soon. The class X solar flare – the most powerful kind of solar flare – spewed from the sun Monday (Feb. 14), unleashing a massive wave of charged particles speeding toward Earth. Now the flare has triggered a geomagnetic storm in our planet's magnetic field that interrupted radio communications in China and could disrupt satellites and power grids as well, AFP reported. Right after the mega solar flare, a first wave of radiation hit Earth. 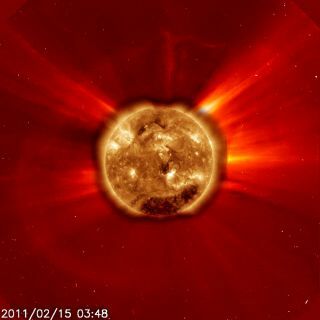 "There were immediate (within 8 minutes — the speed of light) effects on radio communication and GPS systems right as this flare occurred," said Phil Chamberlin, deputy project scientist for NASA's Solar Dynamics Observatory (SDO), which recorded a video of the Valentine's Day flare as it erupted. But flares like this also churn out streams of protons and electrons called coronal mass ejections (CMEs) that can take 24 hours or more to reach Earth, so we are still feeling its effects. In fact, three CMEs are making their way toward our planet right now, and are due to arrive "about mid to late day" today, Feb. 17, the National Oceanic and Atmospheric Association (NOAA) reported. When these particles do arrive, they interact with the Earth's magnetic field to cause chaos in electronics, power and communications. NOAA issues alerts to any industries that could be affected. "These alerts are sent out to electrical power grid companies, airlines, GPS, military, ocean shipping routes, just to name a few industries that may be affected by the impacts of a solar flare and associated coronal mass ejection (CME) like the one we just had," Chamberlin told SPACE.com. CMEs don't just cause damage — they can spark special shows of the northern lights, or aurora borealis. "Further northern lights (aurora) displays are possible sometime over the next two nights if skies are clear and the activity peaks in your local nighttime," according to a report from the British Geological Survey. Monday's class X flare was the most powerful solar eruption in four years. It came on the heels of a few less powerful flares in the days before. Scientists expected this kind of event to start happening now, as the sun is ramping up activity as part of its normal 11-year cycle. Solar maximum is predicted for around 2013.